Once professionally installed your central heating system is continually desludged by the Magnaclean power flushing filter. The only maintenance required is the simple cleaning of the Magnaclean system which our customers do in a simple two minute job. Simply turn the Magnaclean lid, remove and rinse the filter's sheath, which has trapped the sludge, and then replacing the sheath and the lid again. The entire process takes only seconds, so effectively you can desludge your own central heating system - with no technical or plumbing knowledge! Install Magnaclean, with any other installation or upgrade from Joseph C Kenny Plumbing & Heating, Cork, for only €230. Magnaclean can increase heating system efficiency by an estimated amount of up to 20% - what's more it will protect and extend the life of your boiler. Maintain your central heating system at peak performance with Magnaclean desludging filter. Contact us to take advantage of this incredible cost saving innovation. How Magnaclean Professional works in seconds! 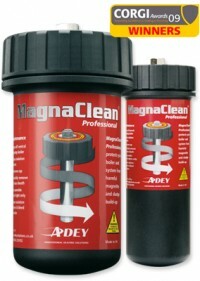 See Adey Magnaclean Professional for more information.